Have you been apple picking this fall? We have been twice. Apple picking is one of many seasonal activities that highlight the presence of nature in our urbanized communities. Here is our short list for fall. The Mommy Poppins blog has an extensive guide to pick your own fruit and vegetable places in the tri-state area. You can forage for apples and crabapples (the latter makes good jelly) throughout the city. The leaves have been changing colors for a few weeks now. The NY Times reviewed leaf peeping apps a couple of years ago. You could travel upstate or to New England this holiday weekend or you could stay in the city and check out local spots of color like the New York Botanical Garden. Time Out has a guide to Fall Foliage in NYC and the Times published a fall color list, too. This year's fall migration in the East is over but mark your calendar for Fall 2014. The Cornell Lab of Ornithology provides regional migration forecasts. You can still watch birds. 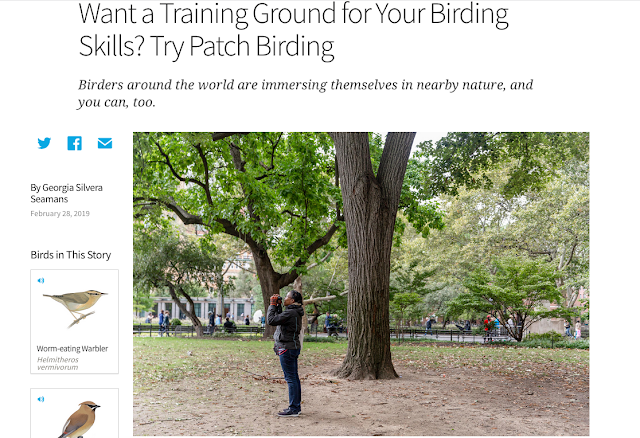 NYC Parks lists birding activities in city parks. NYC Audubon maintains a list of the best places to go birding in each borough. To answer your first question, my family and I went picking at Eckert's - a small country store and apple orchard in Belleville, Illinois - this year we got enough Granny Smith's to make about 7 apple pies. The best time to pick the apples from the trees here is MIssouri is at the end of October, when Granny Smith's and Goldrush's are the most ripe. And to your point about seeing the colors changing at the Botanical Gardens, the best place to see the leaves change is at the wineries in Augusta, Missouri. Montelle is one of my favorites - overlooking a vast amount of rolling hills across the Missouri river. It's simply beautiful. Thanks for sharing! I went apple picking in Werder, a small town known as Berlin's fruit basket because they grow a lot of fruit that is then eaten in the capital. Tomorrow I'm going sledding with huskies, which I realize is a winter activity but maybe we can leaf-peep while we're at it (the sled has wheels for the non-winter months). Don't forget jumping into leaf piles! And I've also considered foraging quince; little decorative ones are ripe in various parks and green spaces around town. LESLIE: Leaf pile jumping - that's a good one! And you are right about foraging, too. Sledding with huskies sounds exciting. If I had a bucket list, I would add this activity to it. STEVE: Did you see any grape harvesting this year? I read that the harvest season in our part of the world runs August to October. Hey! It's been a while since checking back on this post. Yes, I was actually in a wedding out in Augusta, Missouri around September and they were just about to harvest grapes. We had a hot summer so I'm sure they were waiting for the grapes to ripen to their full potential. Thanks for asking!